In sheer gratitude for being one of the few spared damage, she reached out to others. She quickly realized that her neighbors in the Jewish community were doing just fine. 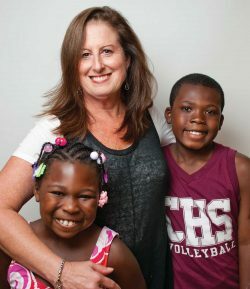 Eleven years and two locations later, The New Orleans Women & Children’s Shelter has grown to allow for 26 families, up to 110 individuals, each family with their own room. The volunteer staff has morphed into a paid staff of nearly 20, including a cook and an Executive Director, Dawn Bradley-Fletcher. The shelter has case management, an employment program, an education wing, an after-school program with tutors, and, last year, the Silvermans dedicated a new play yard and basketball court in memory of their son Jonathan. “From the beginning I always said, ‘No one will ever pay a dime to stay here,’” Silverman says. But that doesn’t mean the residents are at a resort. There are responsibilities and chores, and everyone signs a contract and is expected to behave as a family would. It’s not for everyone, Silverman says, but it has been gratifying to see firm friendships last beyond the experience. As a child, Silverman watched her parents — who didn’t have much money — give back to the community and open their doors to people in need. Her father’s motto was, “You’re no better than anyone else and no one is better than you.” Silverman and her husband,Dan, have always opened their home too, so the shelter is just an extension of that hospitality. Open-door policy: “We make no judgement on anyone who comes through our door,” Silverman says. “We treat every person with dignity and respect, help them help themselves get their lives back on track. It’s incredible watching these women have dreams they can enact for the first time in their lives.” Some 85 percent of residents move out to their own apartment or home. And it’s all because: “The need is there,” Silverman says. “Poverty is so great in New Orleans that there is going to be homelessness and the need for women and children to get off the street and have a safe environment. That’s paramount and we’re it.” Silverman says those who believe homelessness is improving don’t see all the people sleeping in cars and abandoned buildings, and that potential HUD cuts can only make it worse. Stories of hope: Silverman gets letters all the time from people who have moved past a horrible time and gone on to get their GEDs, earn nursing licenses, even a master’s degree. It makes it all worth it to know the shelter helped change the trajectory of their lives.